The amount of earth observation imagery available has multiplied exponentially in the age of satellites and drones. But how can we take advantage of this vast data source and turn it into valuable insights in near real time? Traditional methodologies of extracting and classifying features of the earth’s surface are time consuming and labour intensive. Orbica’s solution to this problem is to automate using artificial intelligence (AI) deep learning algorithms and geospatial processes. We’ve invested in research and development to build our solution and have applied it to waterbodies, roads, vegetation and building outlines. This tool has many uses, from identifying informal settlements to providing valuable datasets for urban planning, environmental management, disaster response and humanitarian mapping. It has also been applied to business problems such as change reporting and build progress reporting. Though AI has been used by the geospatial community for a long time in the form of remote sensing, supervised/unsupervised classification, feature extraction etc. it had a limited scope and required resource expensive multispectral/hyperspectral imagery. Now, with proliferation of AI in almost all sectors of our economy such as autonomous cars, healthcare, finance, agriculture, asset management etc. it has grown the number of players exponentially. For example, it is now possible to use tools developed to identify faces in a picture to identify potential pests and diseases in crops. 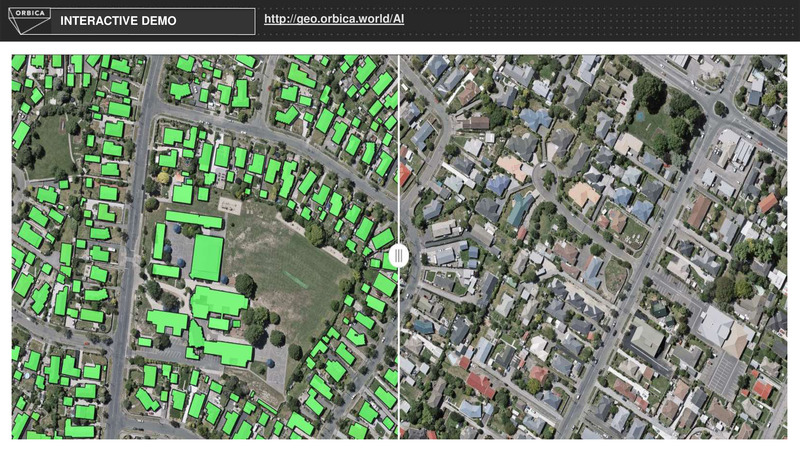 GeoAI uses the power of machine learning and deep learning, such as convolutional neural networks (CNN), to identify building footprints, water bodies and land use, and classify them based on core geographic principles. The tool then applies geoprocessing techniques to further classify and improve these features and prepare for consumption into mapping applications and other geospatial workflows. All the results from the tool feedback to the AI model to increase accuracy and precision of the datasets, which results in an ever-improving dataset.